CENTRAL SQUARE, NY – State Senator Patty Ritchie recently toured American Legion Post 915 and Veteran’s Memorial Park in Central Square. 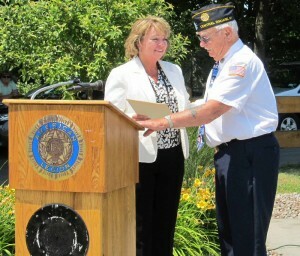 During her visit, Senator Ritchie also honored Herb Pelton, a decorated World War II veteran who served in the Navy. Mr. Pelton continues to serve his community today as a 64-year member of the American Legion. Senator Ritchie is pictured with Herb Pelton in Veteran’s Memorial Park.